The preparations - Website of jackofspades! 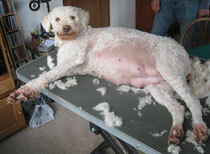 The countdown has started, the puppies are expected to be born in about twelve days. We have started with the necessary preparations. 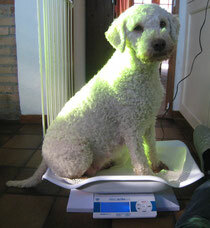 Elena is testing the new puppy weighing scales. She only just fits on! 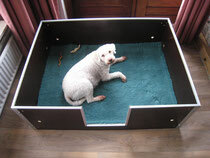 We put a piece of vinyl in a corner of the living room and assemble the box in which Elena will have her puppies. The mother to be is critically supervising these activities while walking, standing, sitting or laying in the way as much as she can. "Good box, good spot...but that bedding does not quite fit"
"Much better, still a bit bare on the whole though"
"This corner will be the bedroom I reckon"
All is still going well with Elena and her pregnancy. She is cheerful, still enjoying her walks and therefore we haven't shortened the walks yet. However, she is keeping the same pace as us now rather than covering three times the distance at least. She stopped swimming but still likes to get her feet wet, bringing us sticks and sniffing around. 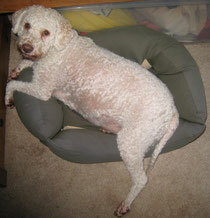 This morning I clipped the coat on her body and legs. Most of the fur on her belly had already disappeared under the influence of hormones so I removed the last remaining patches as well. The puppies will enjoy Elena's bodyheat more directly and hopefully Elena won't get too hot too quickly laying in the warm box with them. Seen from this angle one could hardly tell Elena is pregnant. From this angle she is quite obvious pregnant. And from this angle she seems gigantic! No signs of a forthcoming delivery yet. Elena is very relaxed and takes a few more naps during the day. The puppies are very active today, you can feel them moving when you touch her belly and sometimes you can even see them moving. Elena still thoroughly enjoys her meals but seems to be less gluttonous and unsatiable than before. 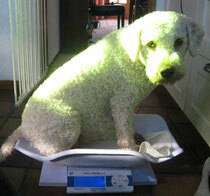 Her weight increase is levelling out and we expect it might be a small to average size litter. But we still have to wait and see of course. She is still keen to go for walks and takes the occasional sprint when there are birds or rabbits in sight. She is very interested to play "tuck of war" games with us, the extra kilo's are to her advantage! 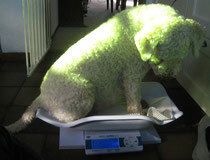 Over 16 kilo's....excluding the tail ! Still no puppies in sight. 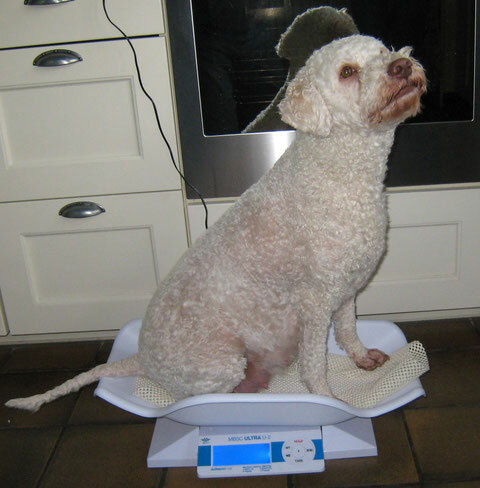 Usually the body temperature of a dog drops 0.5 to 1.5 degrees Celsius 12 to 24 hours prior to the start of the birth. Last night Elena’s temperature had dropped from 37.5 to 37.0. This morning it had dropped still further from 37.0 to 36.5. 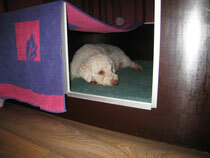 However, Elena behaves quiet, sleeps a lot and does not shiver or shake. Both her mother and grandmother have never stuck to this “temperature rule” and were often hypothermic much longer in advance. So we will patiently wait and see. She still fancied a walk this morning but was no longer interested in sniffing around. To be on the safe side, I slept on the couch in the living room last night. Elena spends quite some time in the box and every now and then she shows nesting behaviour with the towels I have put in the box for this purpose. She still wants to sleep in her favourite basket as well. This basket was already too small when we bought it but she liked it so much that we chose to keep it. With a lot of deep sighing she still manages to squeeze herself in. Apparently it is not very comfortable and after five minutes she returns to her box.